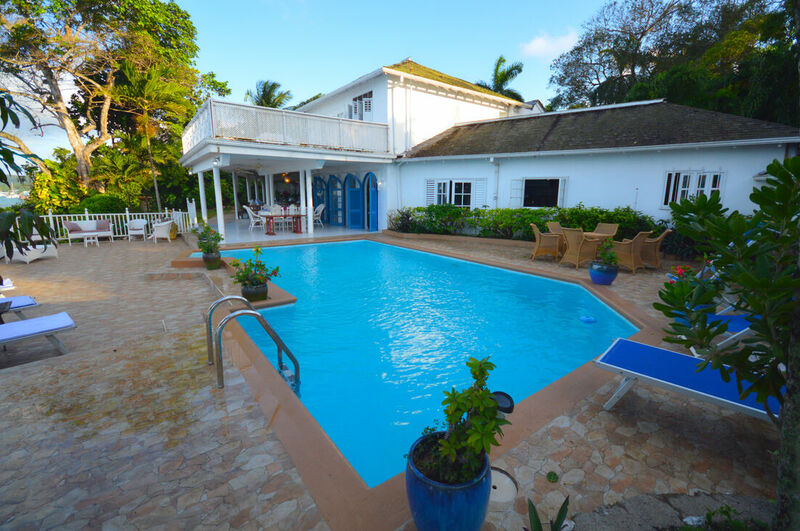 Absolute waterfront private villa with swimming pool and great cook, butler, housekeeper - Five bedrooms at Lime Tree villa. 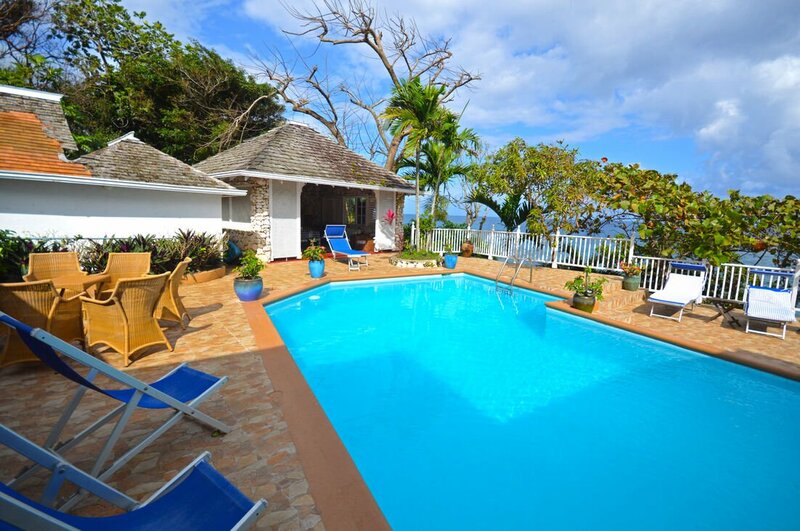 Waterfront villa in Ocho Rios! 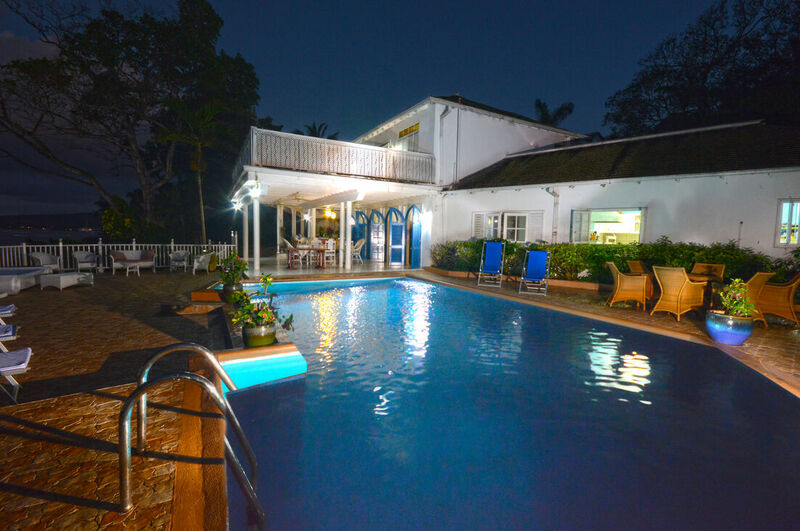 5 bedrooms, swimming pool, fully staffed! 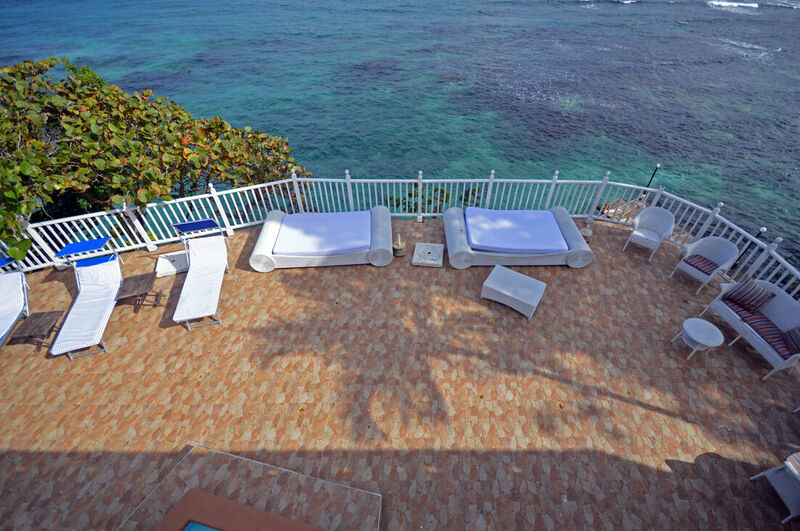 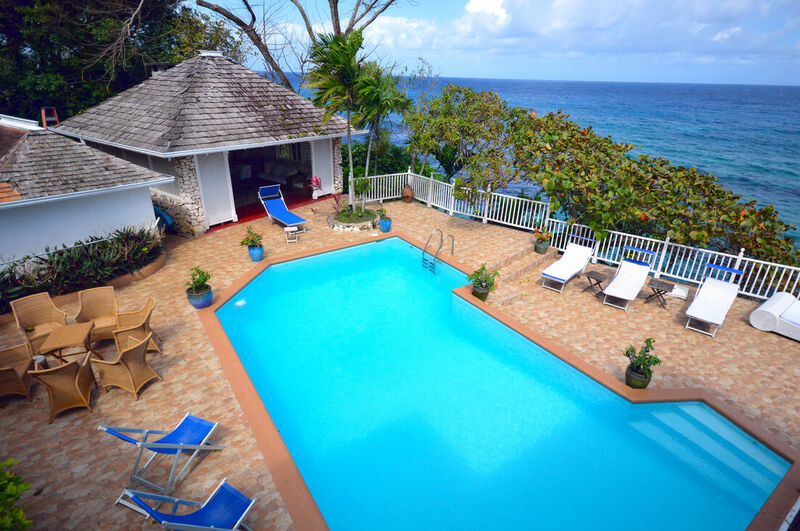 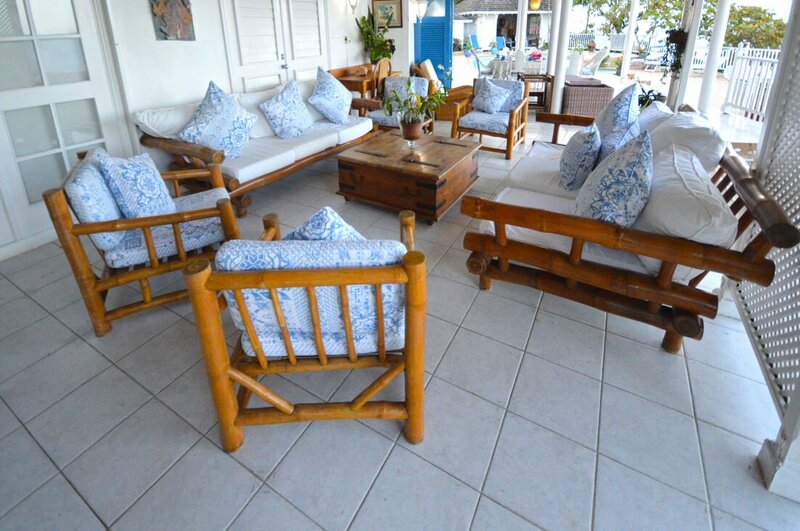 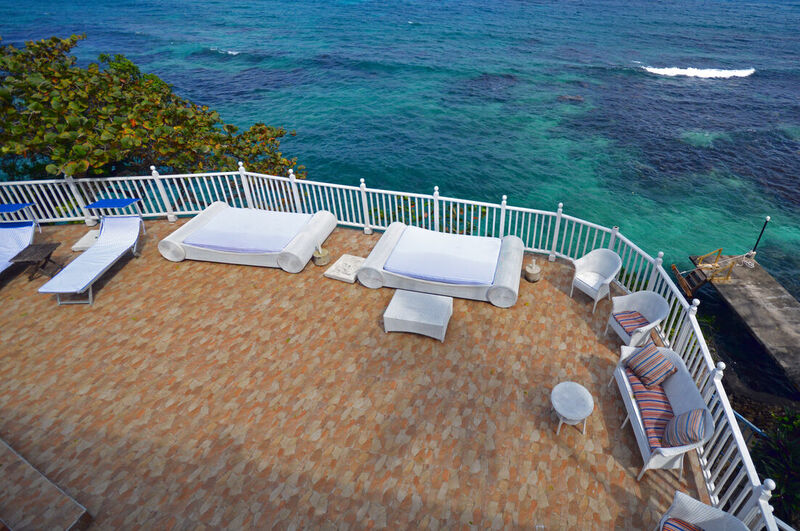 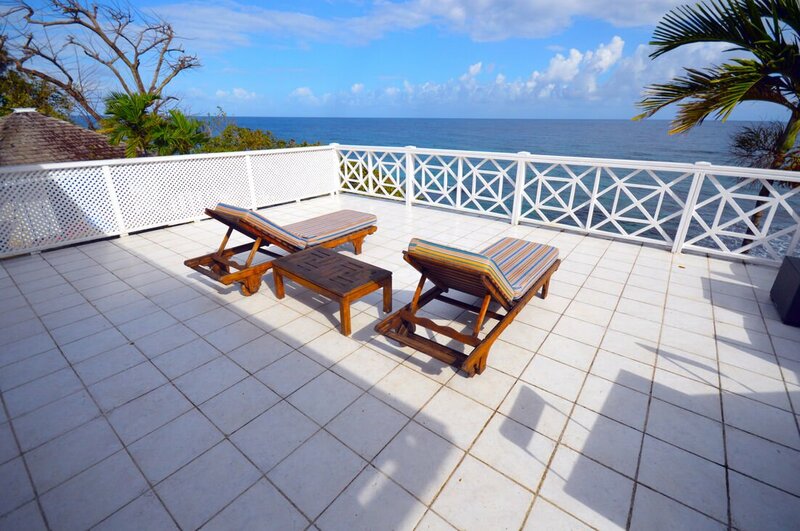 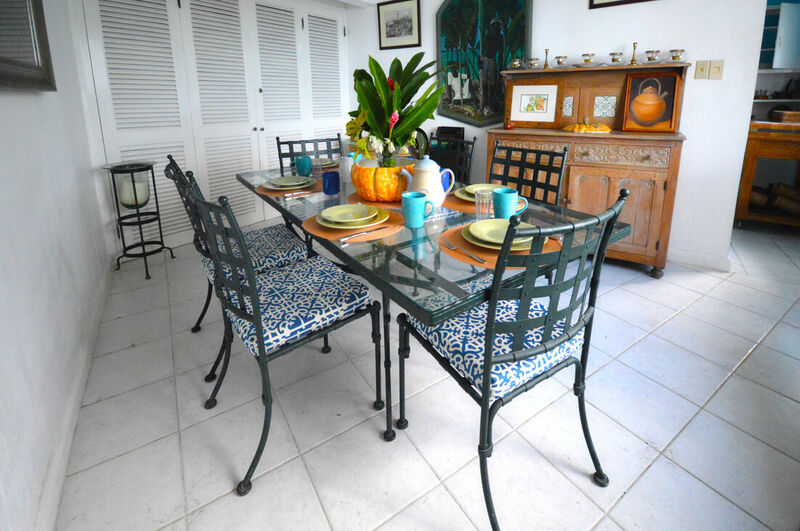 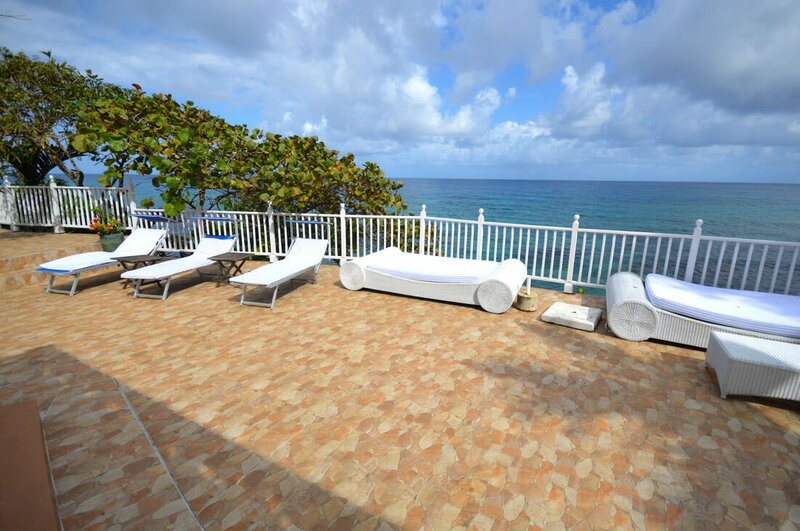 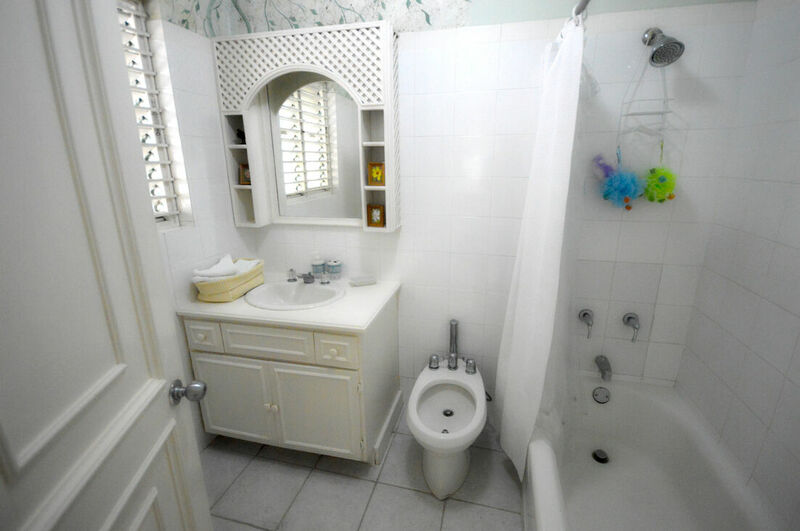 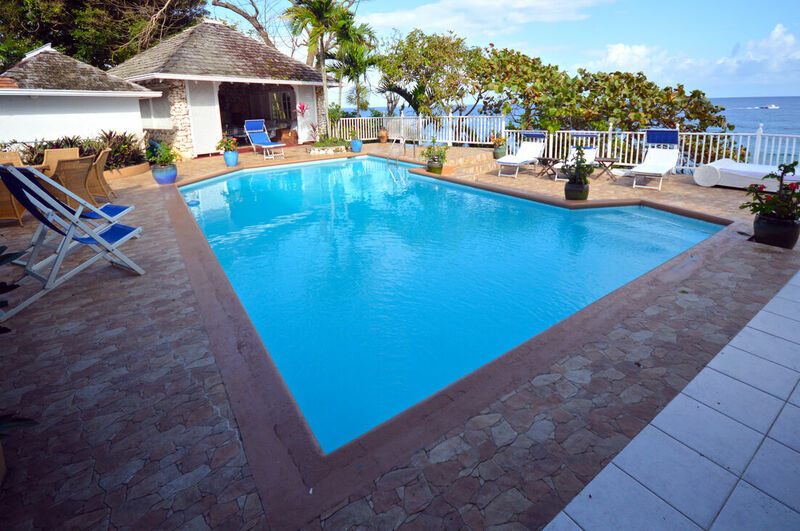 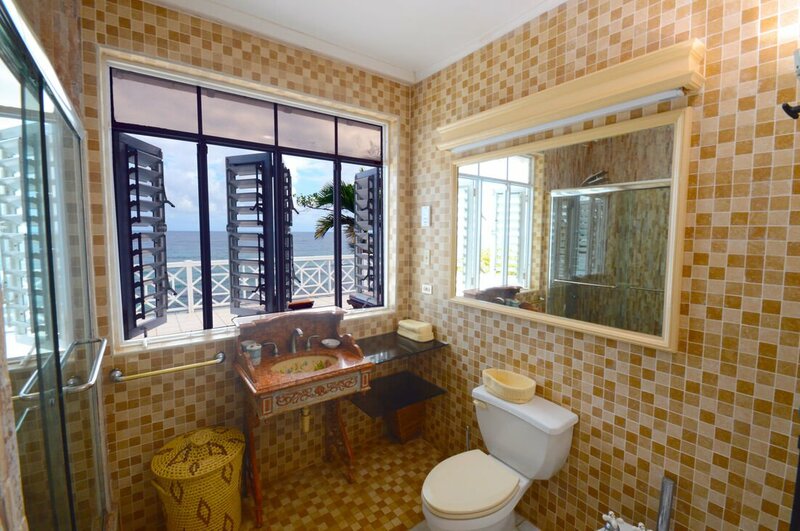 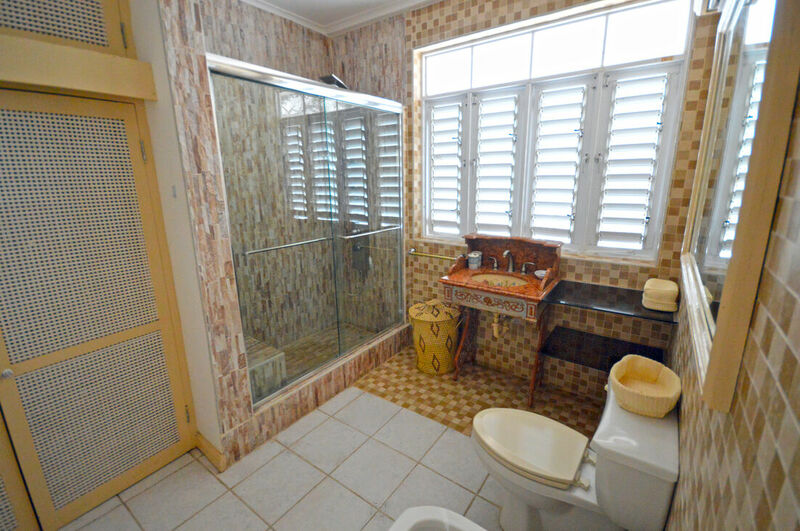 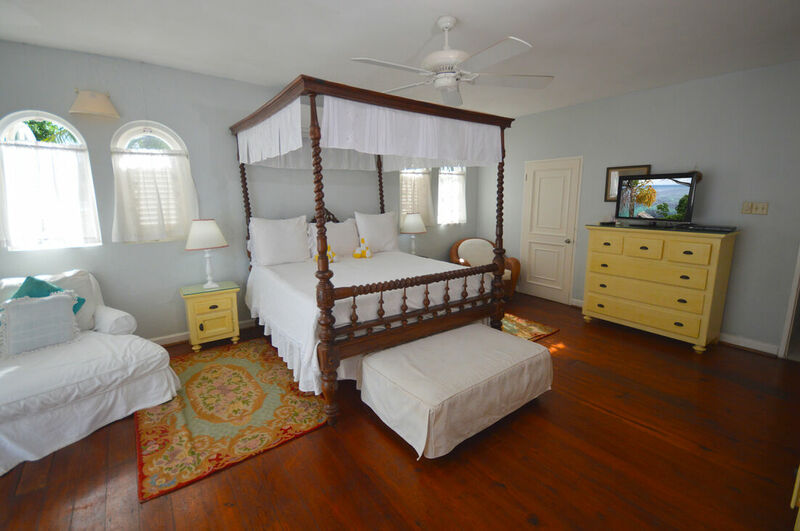 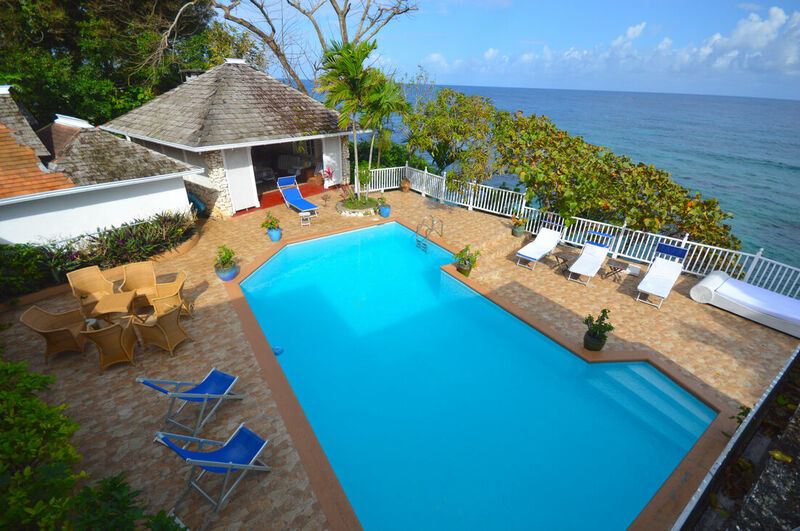 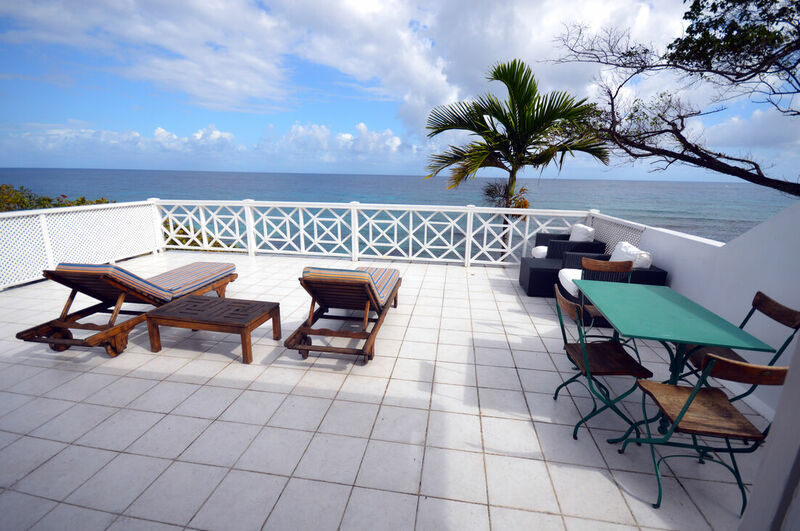 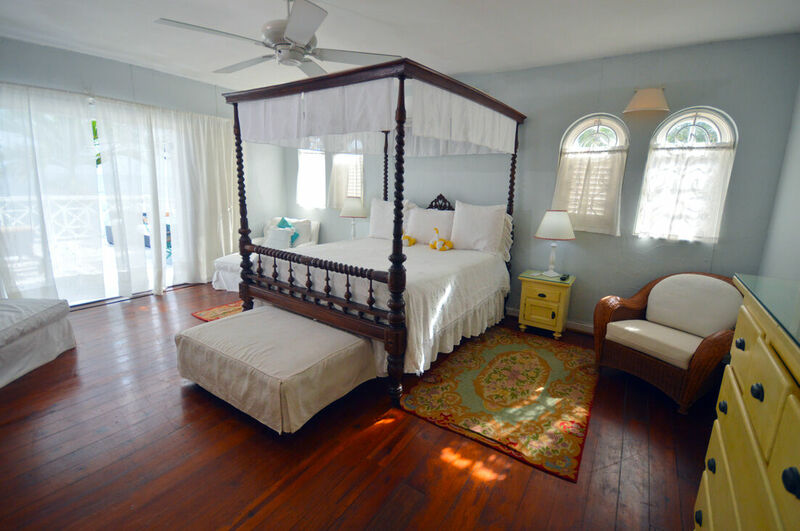 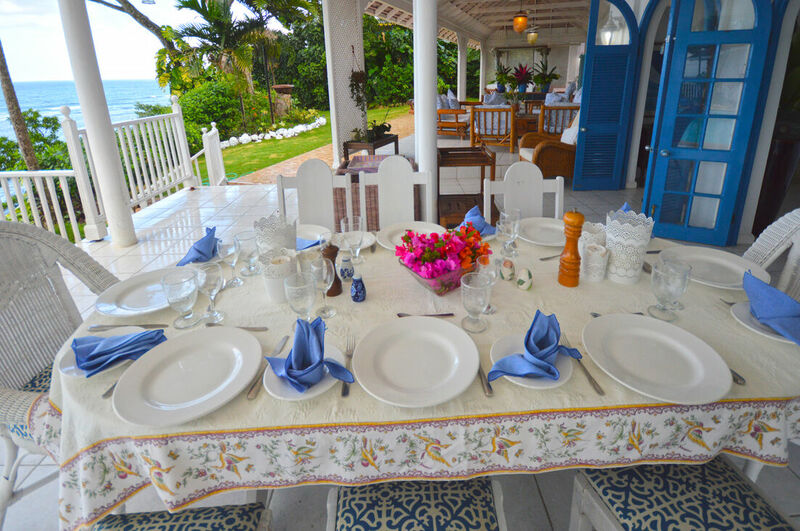 The casually elegant Lime Tree Villa is a fantastic water-front villa in the lively town of Ocho Rios. 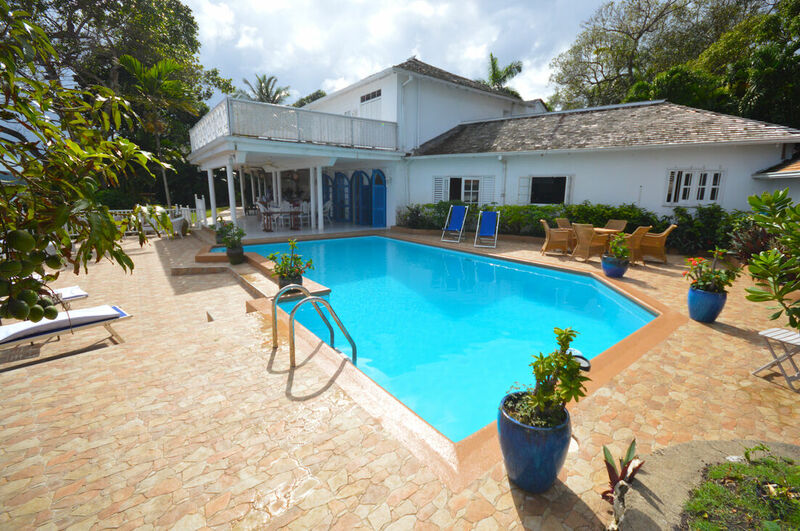 Five beautiful bedrooms, a spacious swimming pool and an excellent staff make this villa in Jamaica a fabulous choice for a Caribbean holiday. 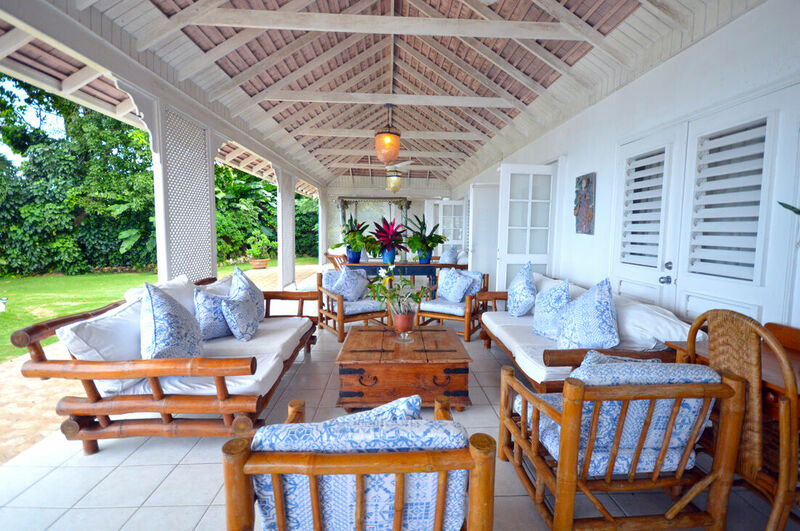 White lime trees and lovely bamboo furniture create a tropical ambiance at this fabulous luxury villa Jamaica. 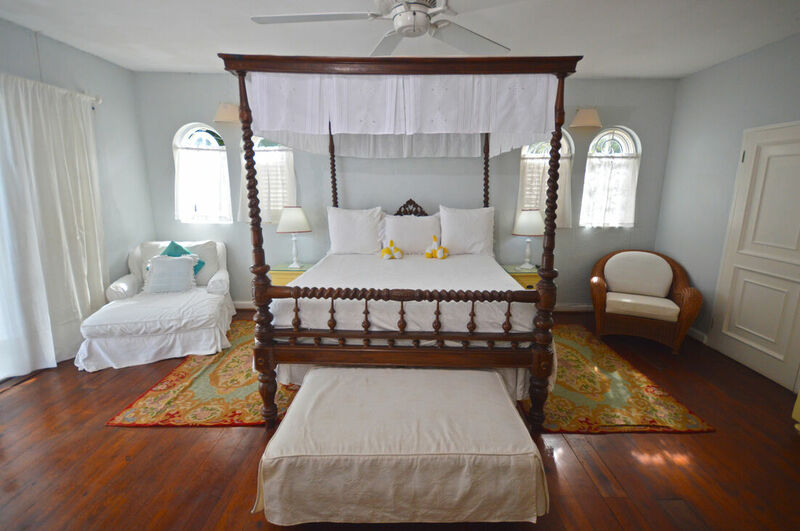 The main house at Lime Tree Villa houses two spacious air-conditioned bedrooms with en suite bathrooms, located on the ground floor. 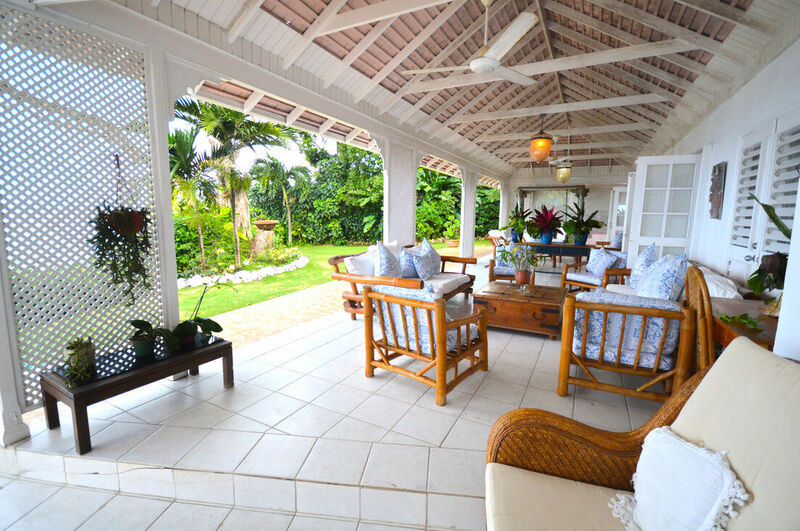 Both bedrooms open onto an expansive covered verandah. 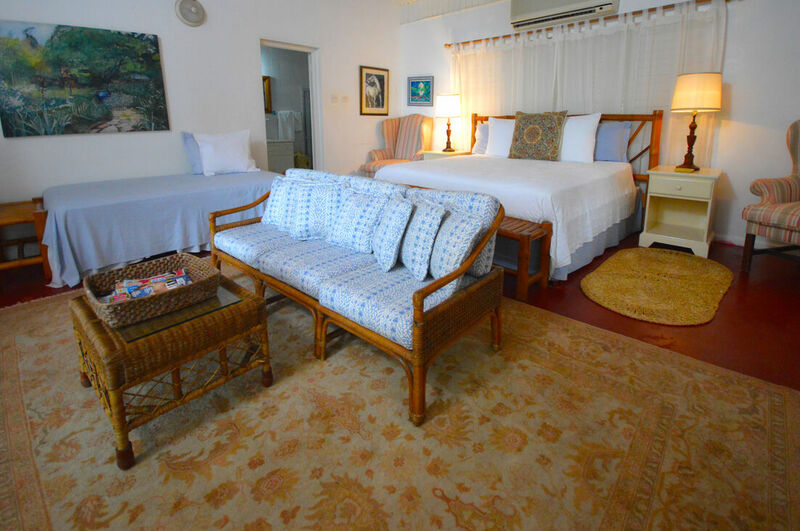 The living room is furnished with very comfortable furniture, cable television, CD and CVC player. 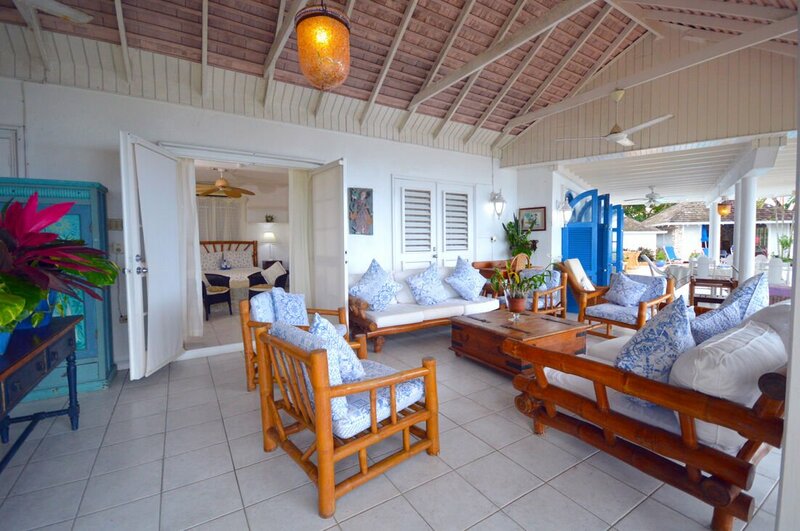 Large French doors in the living area open onto a spacious covered veranda that offers seating for comfortable lounging and an outdoor dining section. 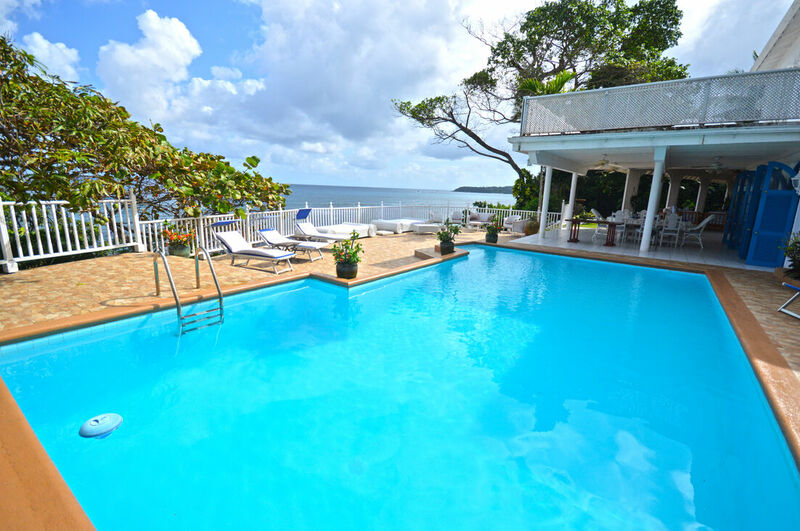 The view from the verandah is spectacular as its looks over the freshwater pool, the surrounding gardens and the sparkling waters of the Caribbean. 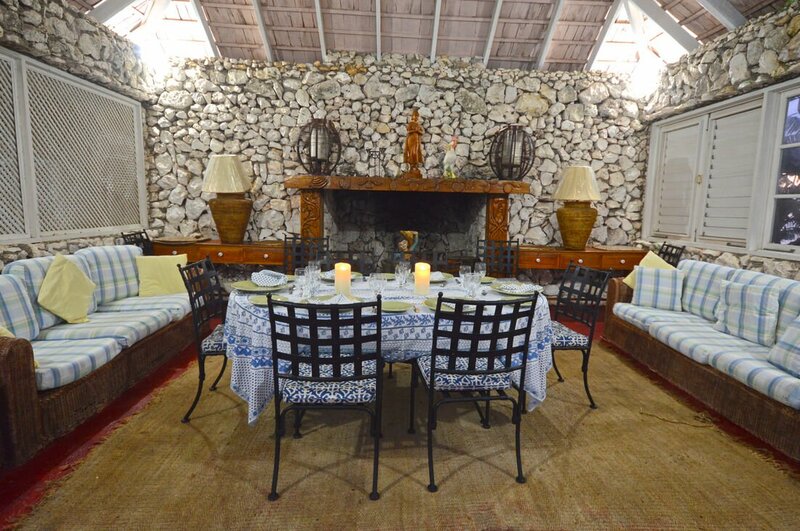 A pool house beyond the pool has a fireplace for those rare chilly evenings in this tropical region. 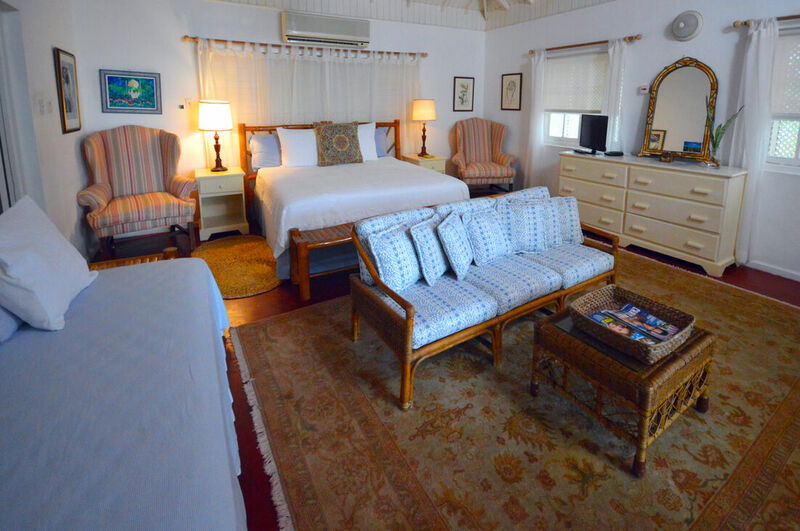 The rather spacious master bedroom is located on the first floor and has its own private veranda with lovely garden and ocean views. 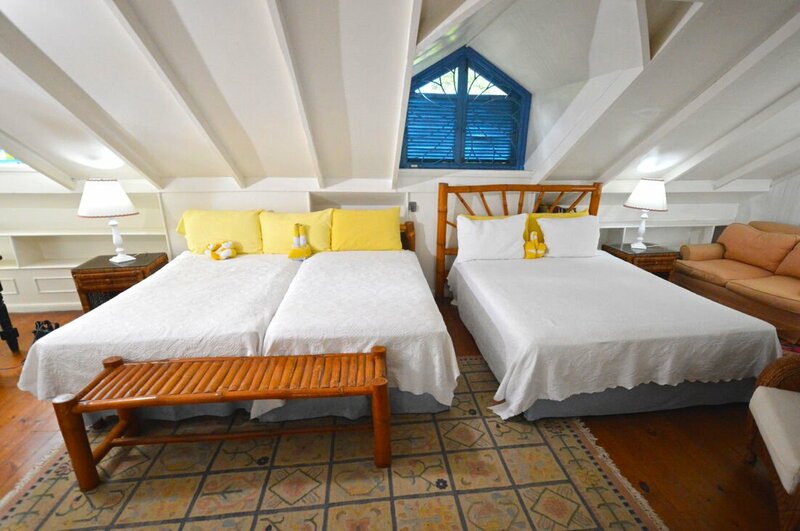 Below the eaves in another bedroom with two twin beds, perfect for children. 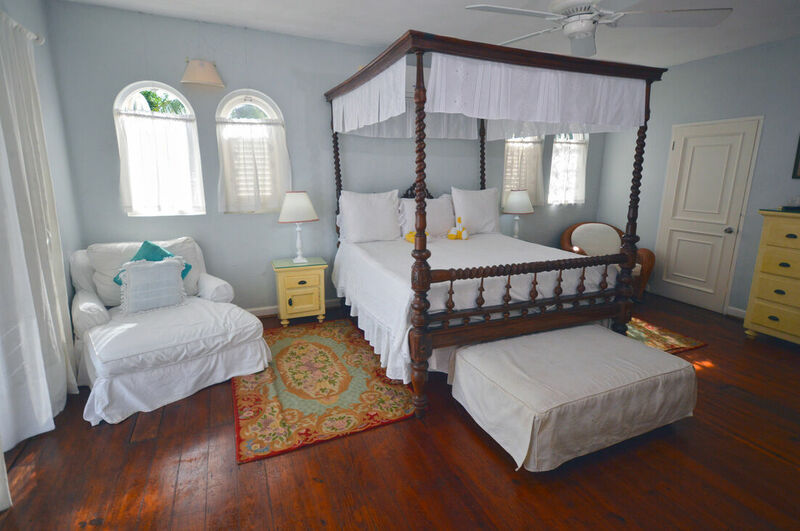 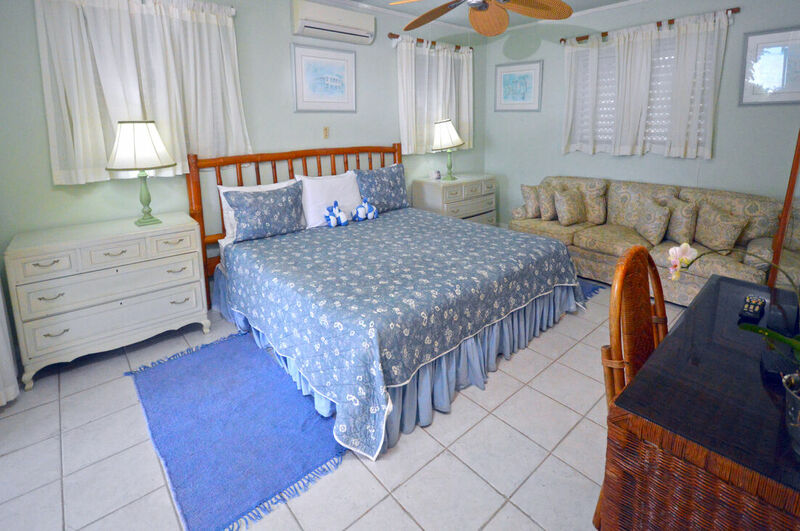 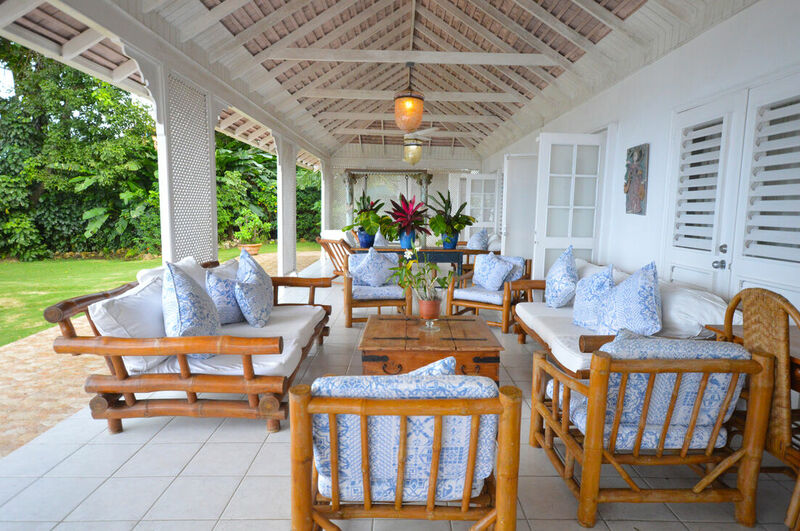 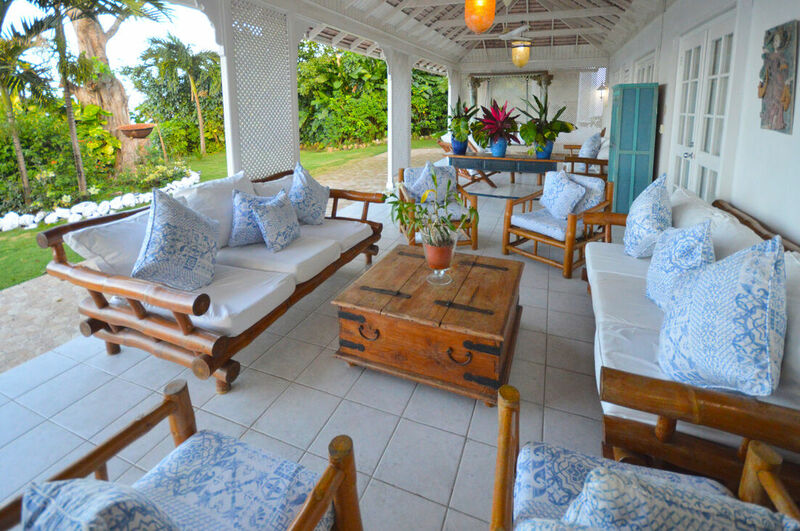 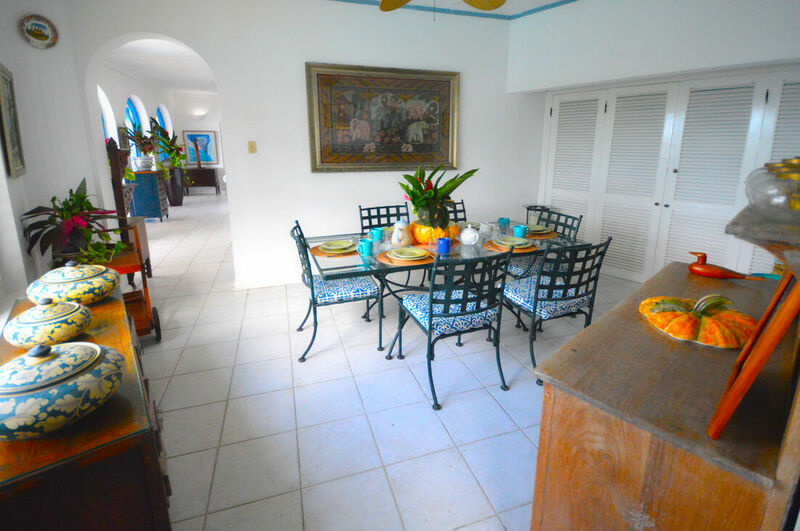 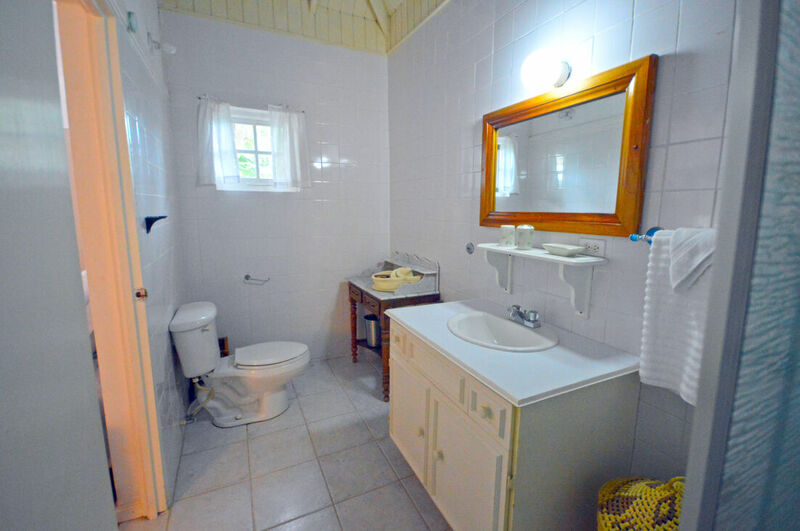 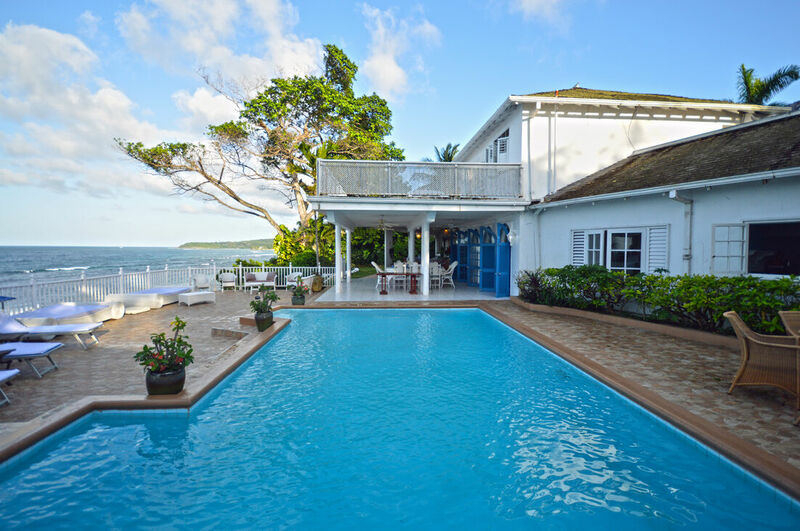 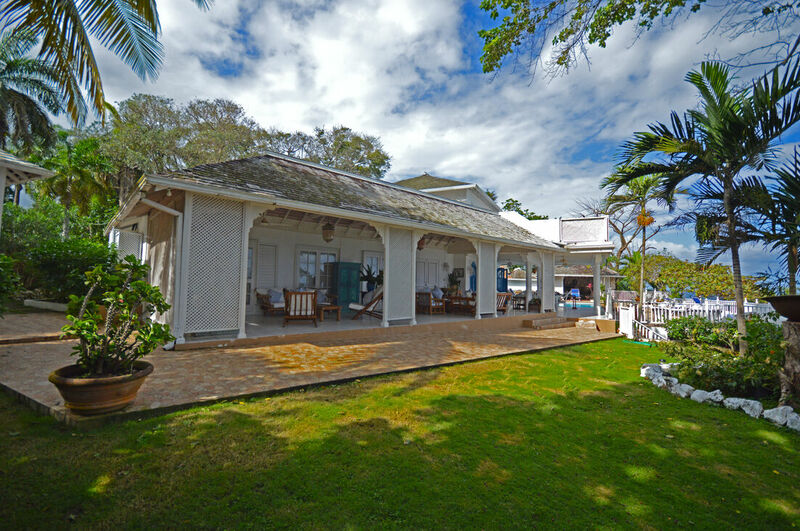 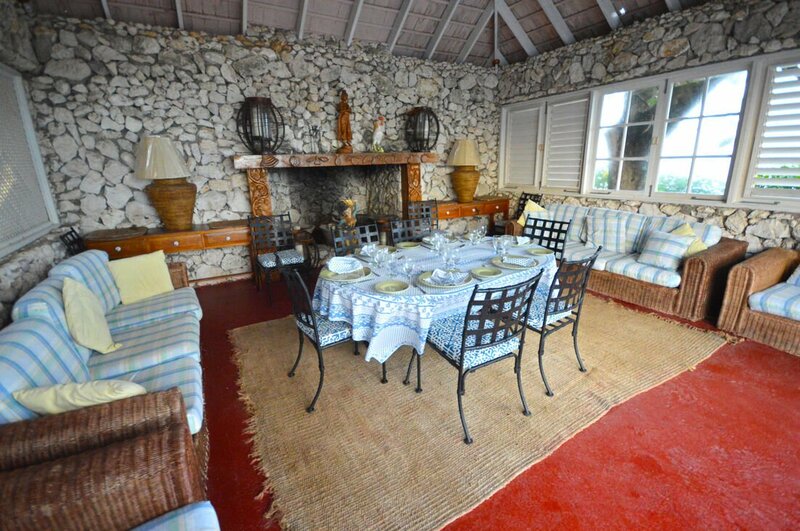 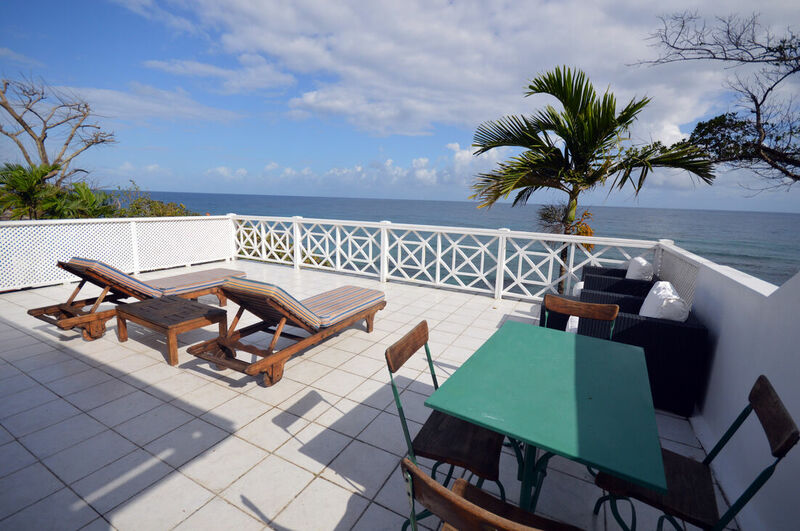 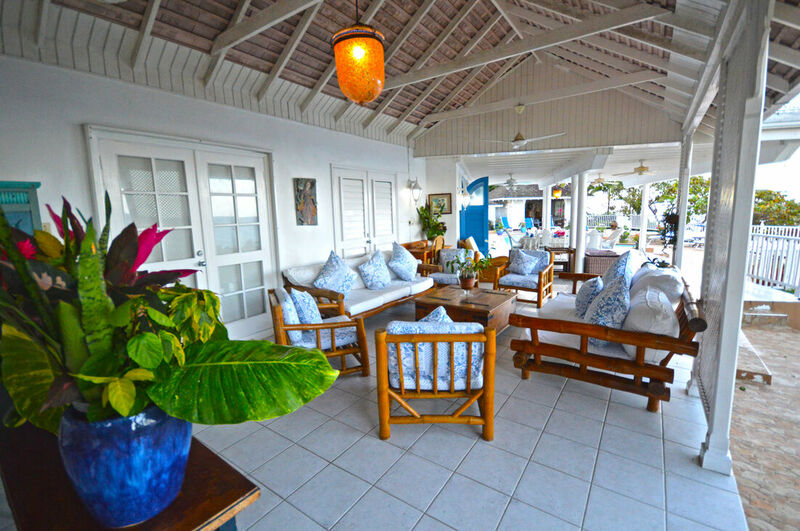 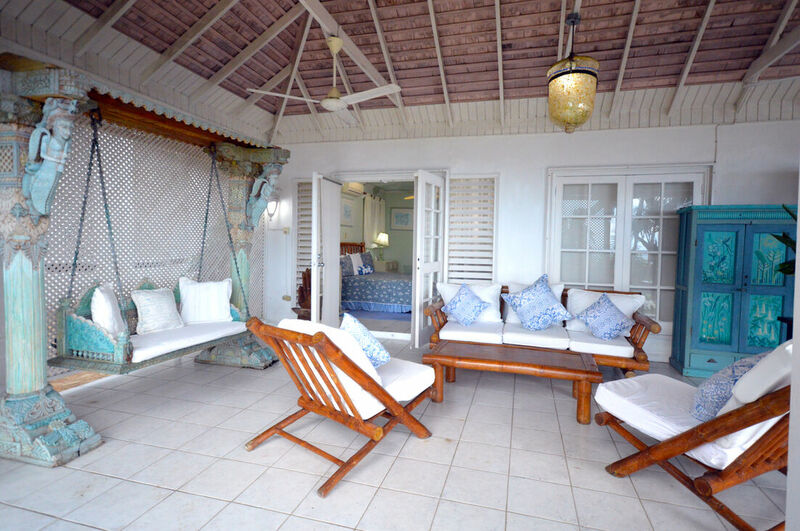 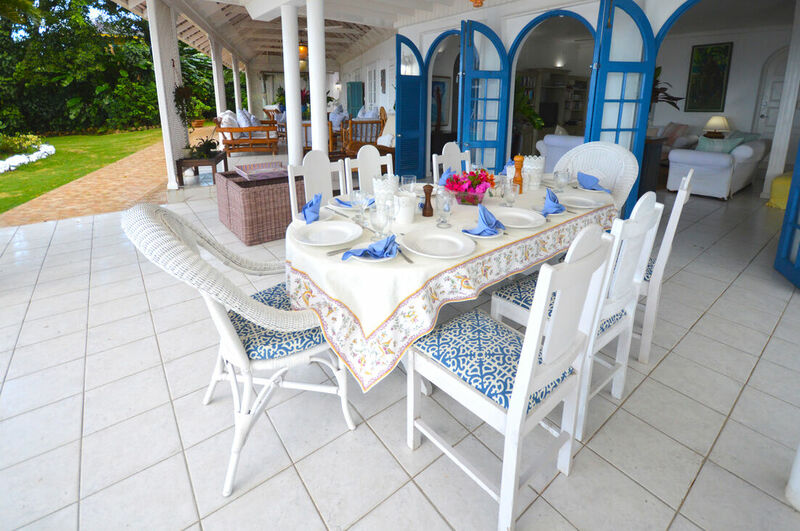 A large private cottage is located adjacent to the main villa at Lime Tree Villa. 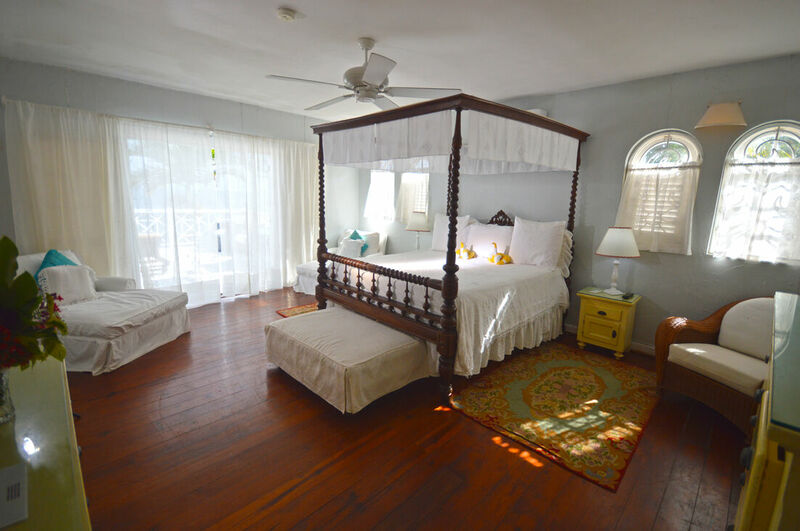 Built in 2003, the cottage was designed to be the second master suite. 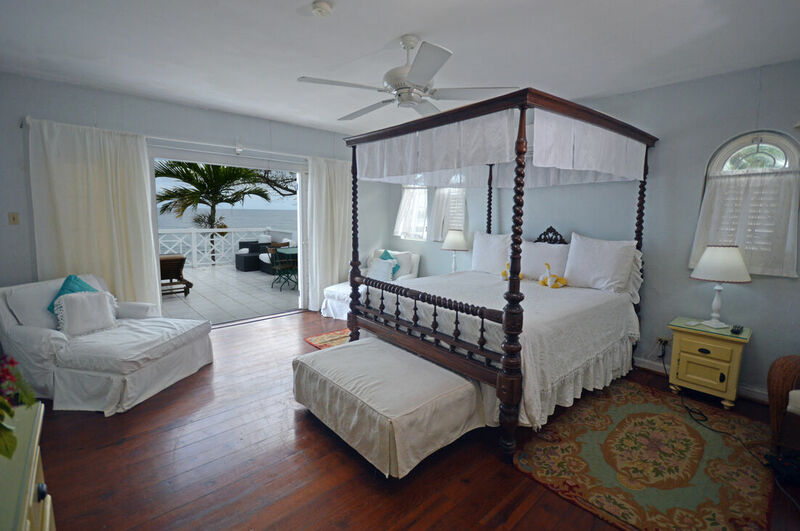 A luxurious bedroom serves as the second master bedroom and has its own en suite bathroom and private veranda that offers ocean views. 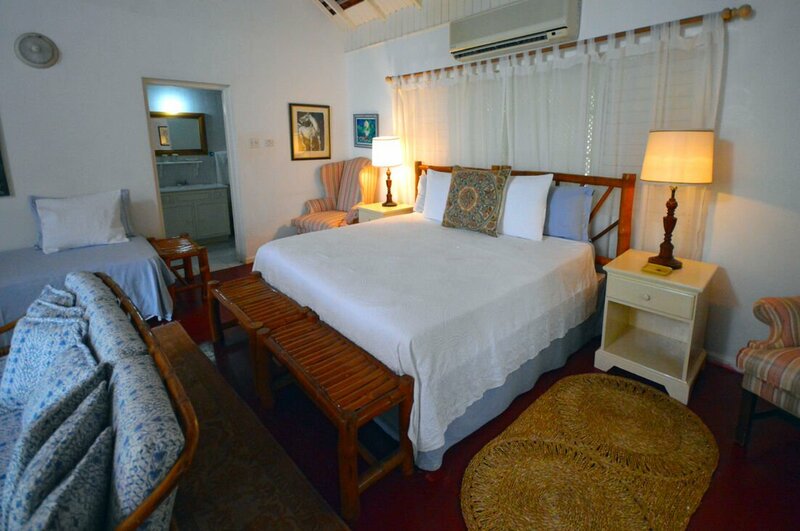 The other bedrooms open onto a large terrace and are furnished with twin or king-sized beds. 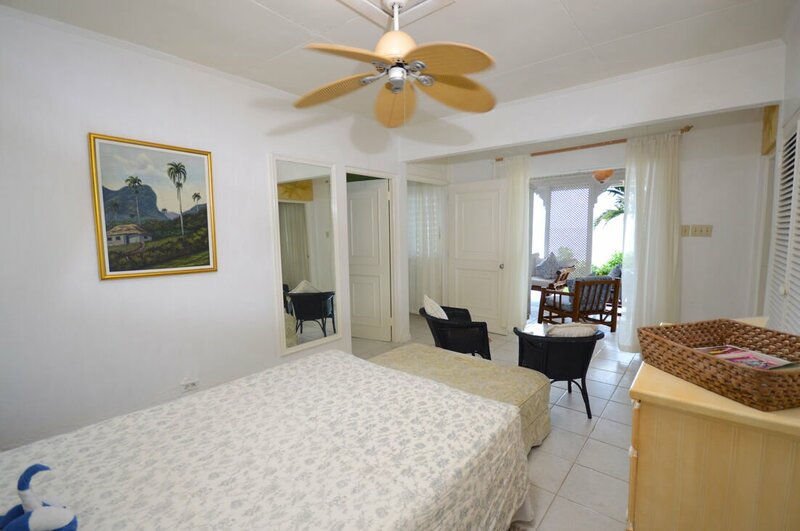 All rooms at the cottage have ceiling fans and air-conditioning. 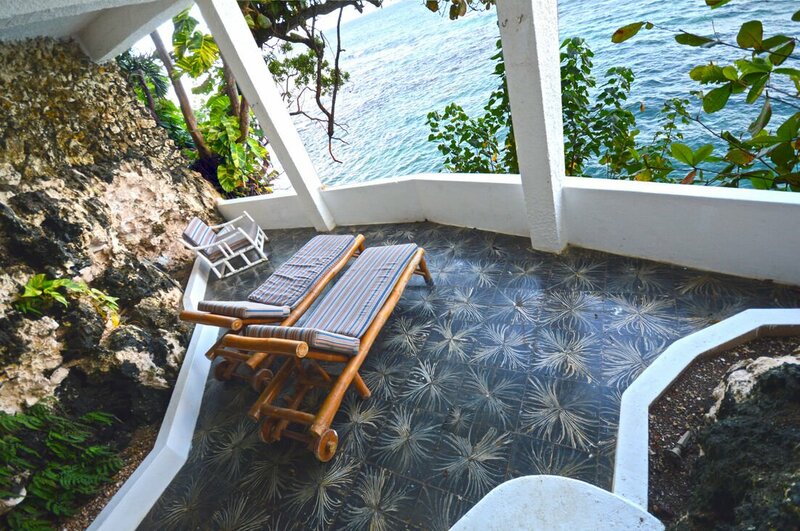 A flight of stairs below the swimming pool leads to the grotto, which is a very pleasant place for anyone seeking privacy and a peaceful evening drink while enjoying the cool sea breezes. 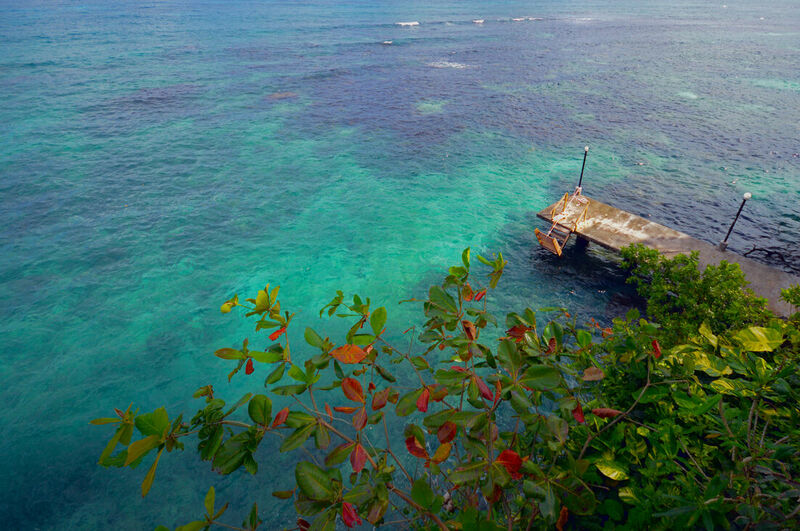 Another set of stairs leads down to the jetty below and access to the glittering ocean waters. 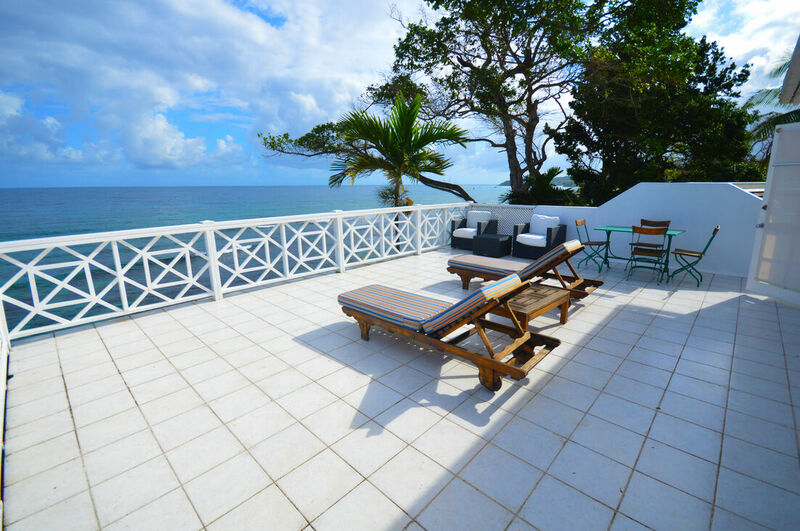 Since the villa rental in Jamaica is located on small clusters of cliffs, any guests with young children (ages 6 and below) will have to hire a nanny. 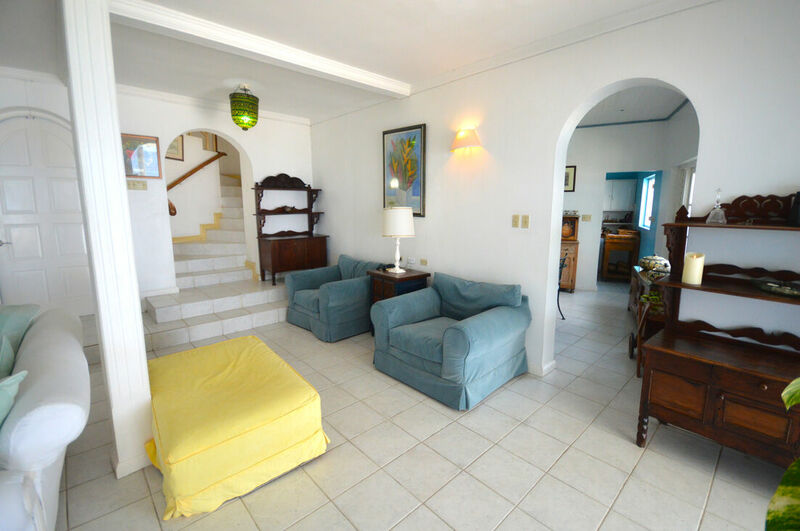 Pet lovers will fall in love with the Jamaica villa’s pet dogs. 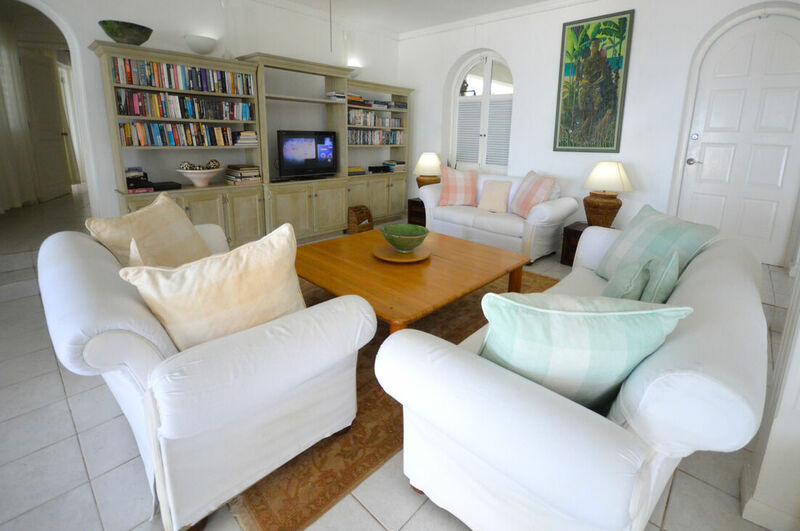 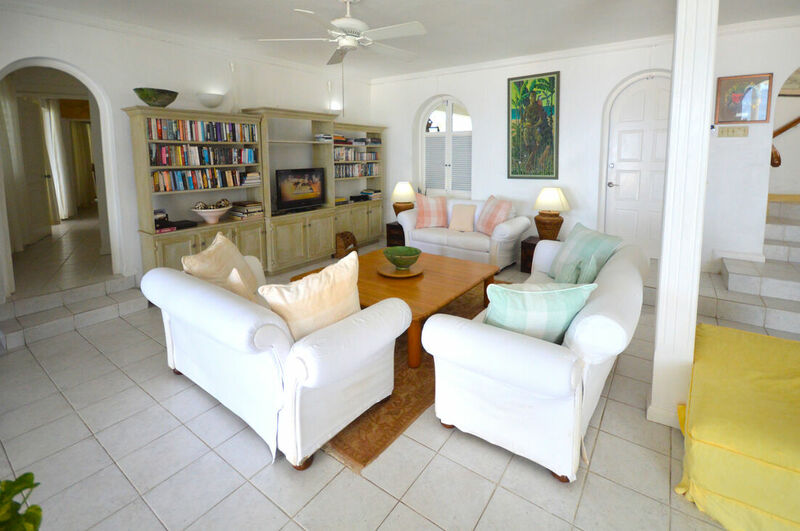 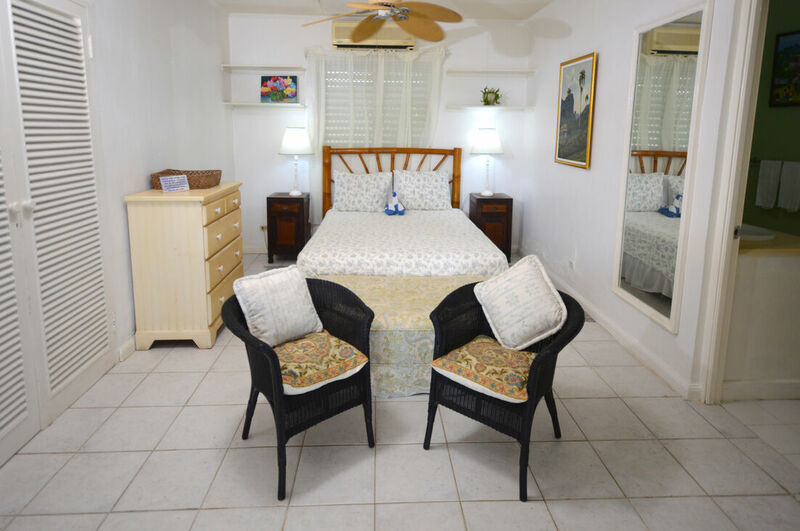 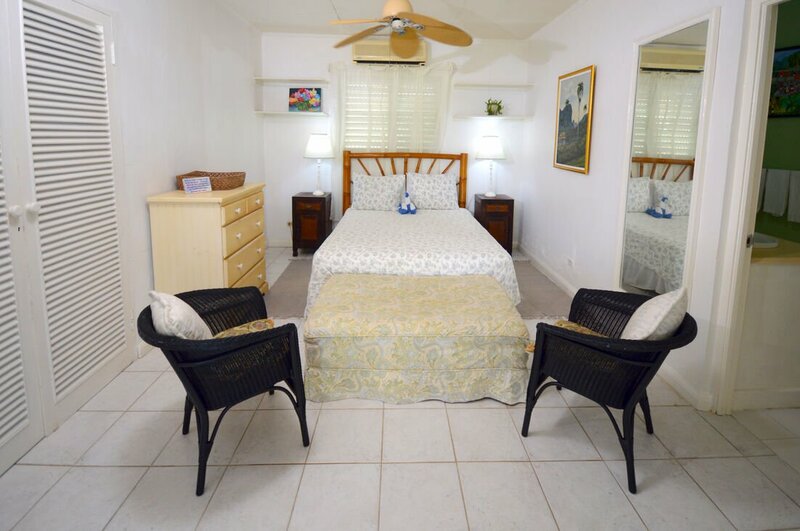 Lime Tree Villa offers accommodation for ten persons. 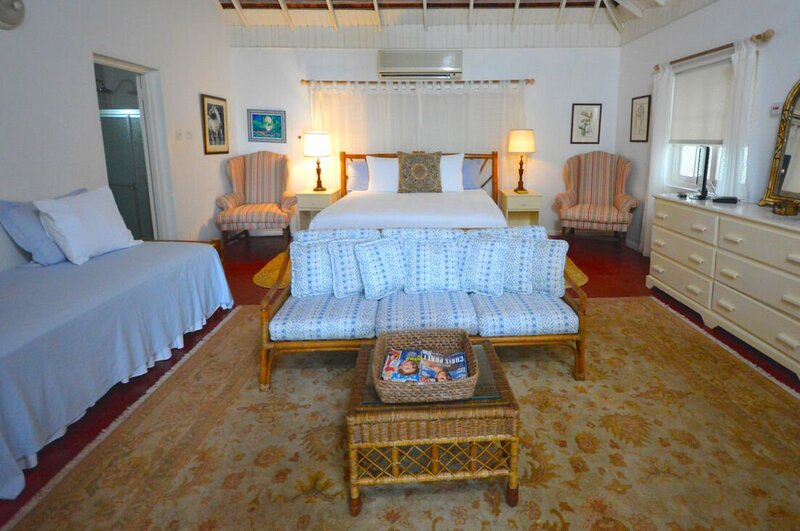 Bedroom 1: Master Bedroom on second floor, king bed, large terrace, ocean views. 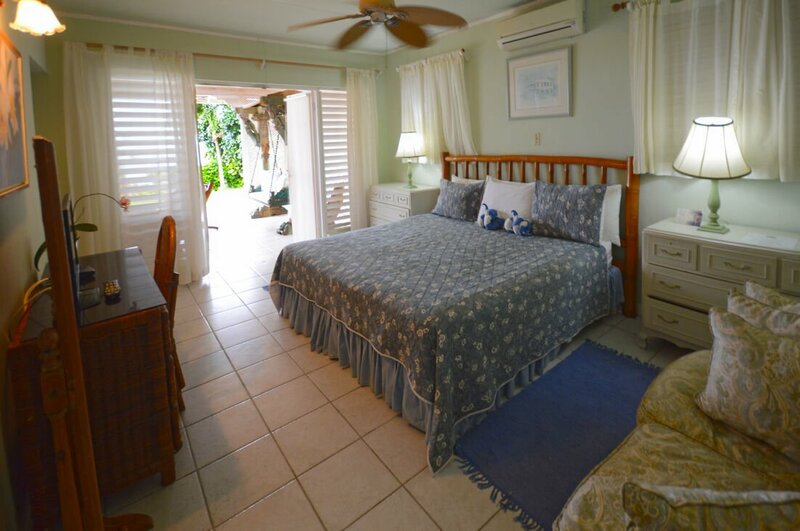 Bedroom 2: Queen bed and single bed, looks to front garden and side. 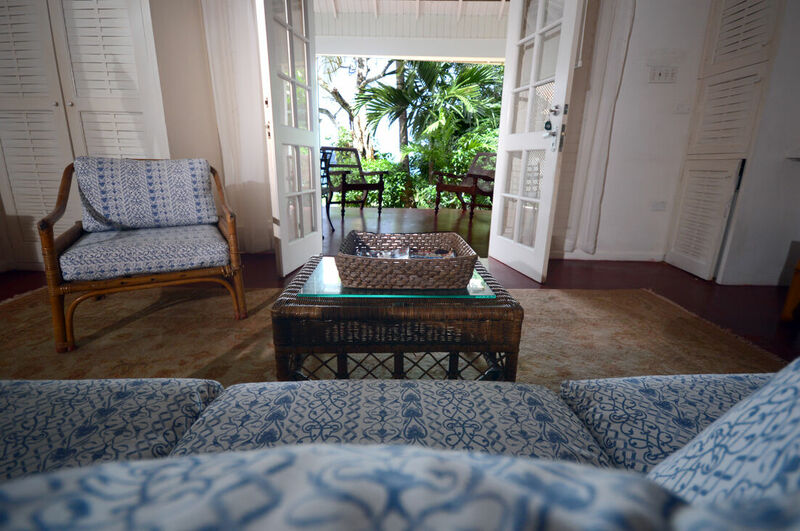 Bedroom 3: Ground Floor with French doors to ground floor terrace. 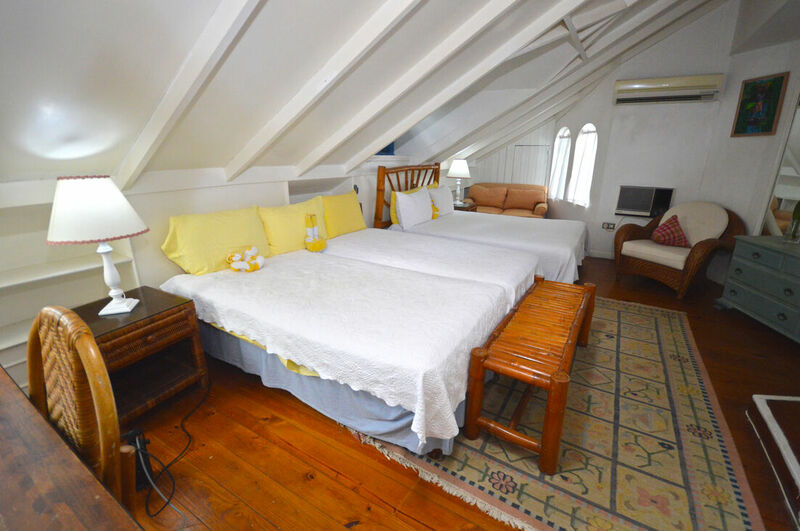 Queen bed and single bed. 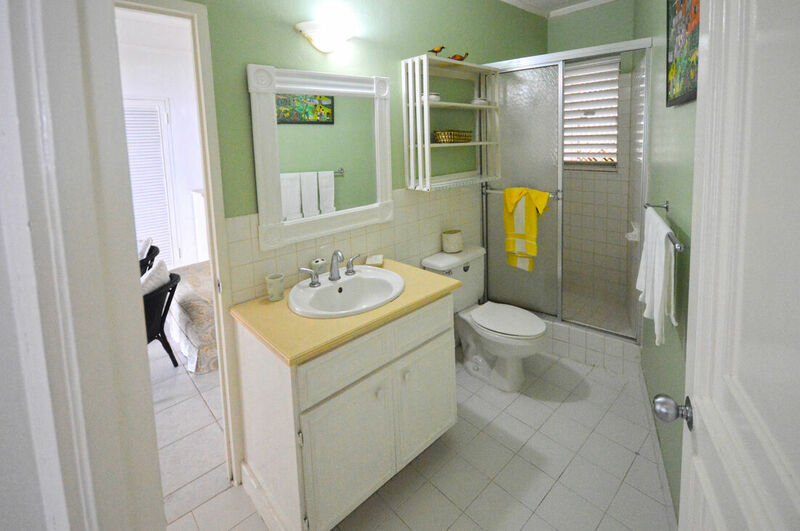 Bath with shower and tub, air-conditioning and ceiling fan. 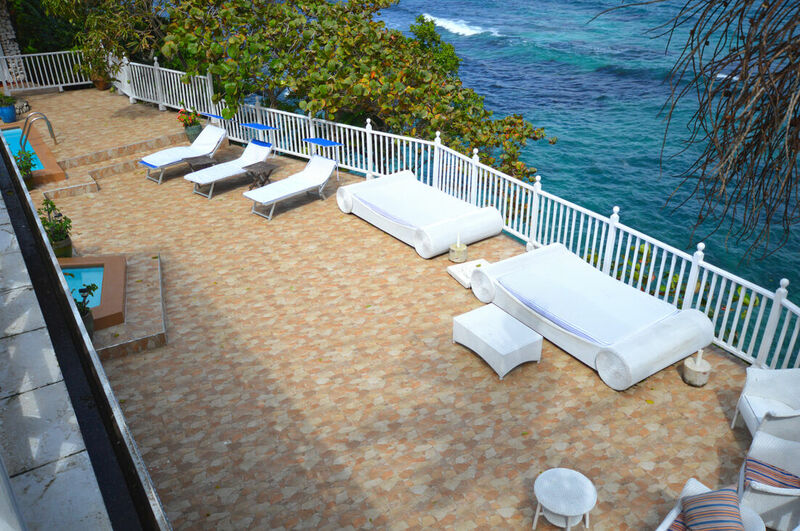 * If renting more than 10 persons, surcharge of $50 per person per night applied. 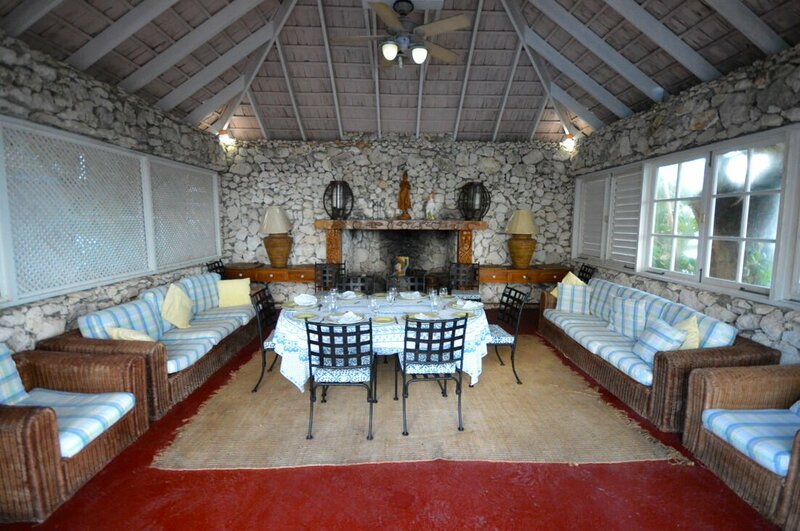 Rentals less than a week, a 25% surcharge applied. 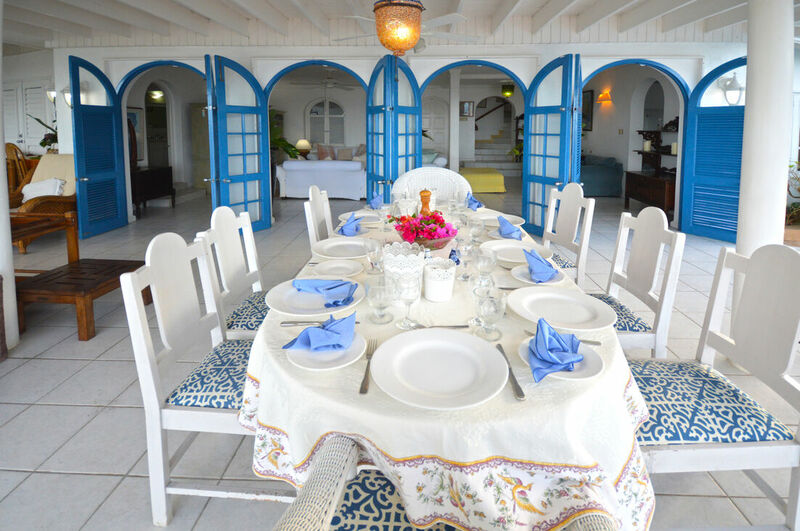 * Weddings: up to a maximum of 50 persons. 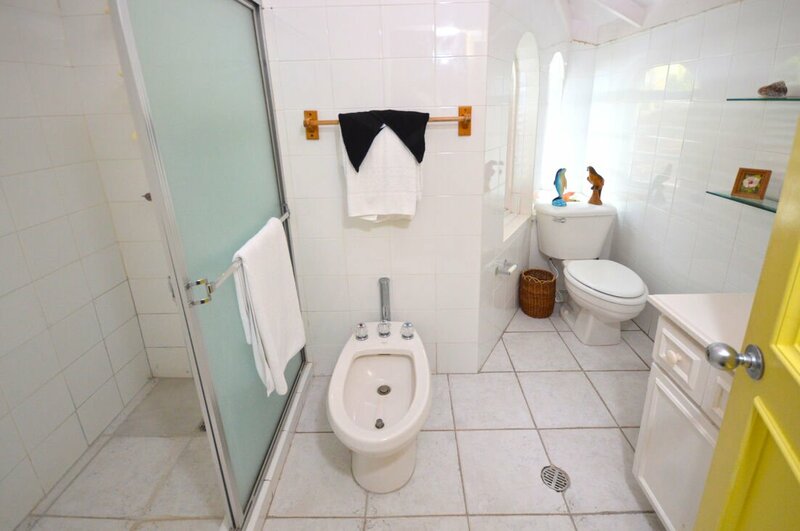 Wedding fee is $500. 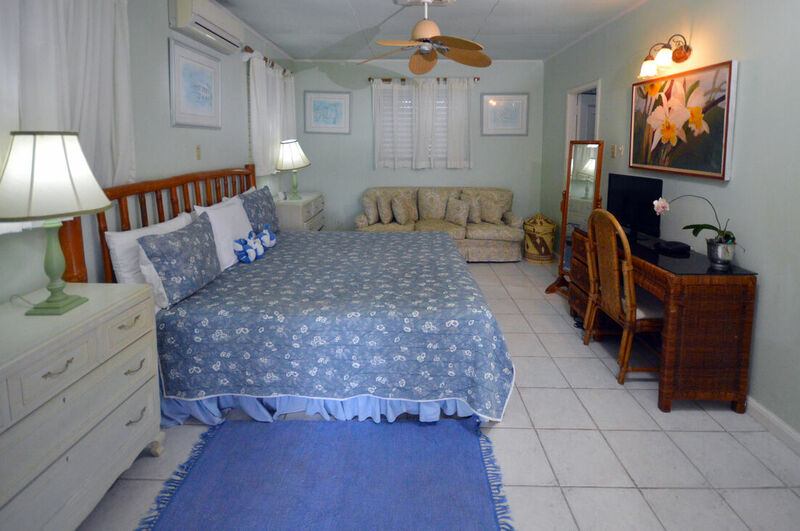 Minimum 4 night rental.